With Killzone: Shadow Fall wrapping up, Guerrilla Games is moving its staff onto a new IP. 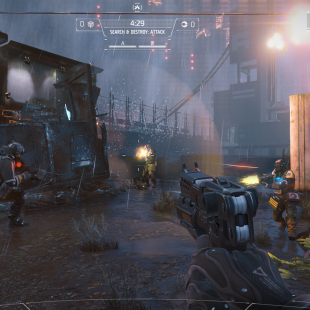 Killzone is arguably one of Sony's biggest PlayStation exclusive properties and, in turn, it's kept Guerrilla Games pretty busy since the franchise first launched back in 2004. That being said, Guerrilla has confirmed that with work on Killzone: Shadow Fall wrapping up, members of its staff have begun to move onto the studio's next game: a new IP. "That's definitely what's happening right now. I can't tell you what we're thinking of but yes," said Eric Boltjes, lead designer for Shadow Fall. "As a studio we do want to branch out, and we have started work on a new IP, something completely different to Killzone. I don't want to say anything about it right now, but as a studio we do want to keep it fresh." Obviously, with the studio staying mum on the details of what "completely different" could mean, the big question is where Guerrilla will go now that it's looking to expand beyond the Killzone franchise. Will it be an online effort a la Destiny, Bungie's big and different effort following Halo? Or should gamers brace for something truly out of the studio's usual step? Honestly, it might be nice to see more of the latter. While the Killzone games have perhaps not always lived up to the grander hopes some have had for them, the series, by-and-large, has been very solid. Killzone 2 and 3, are arguably two of the best exclusive shooters on the PS3 while Killzone: Mercenary has largely been regarded as a great game and proof that the Vita can deliver an honest-to-goodness FPS experience. Putting the talent behind those games into something new, in turn, could be an exciting opportunity that we'd hate to see Guerrilla and Sony pass up.